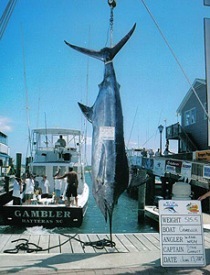 Experience the excitement of Hatteras offshore fishing aboard the charter boat Gambler. Owner and Captain Steve Garrett has more than 20 years of fishing experience - whether you're an experienced angler or novice, he'll hook you up! Gambler is a 42' sportfisher, rigged with modern electronics and tackle, from spinning rods to 130's. Let our experienced and courteous crew make your Hatteras vacation memorable. Treat your family to a day of offshore fishing, or "test the water" with a half day inshore trip - fun for the kids! All bait, ice, and tackle provided. Tournament rates upon request.